Cash-crunched state governments have resolved to demand from President Muhammadu Buhari, the refund of money spent on executing Federal Government projects in their respective states. They argued that doing so was the only option before them since the Federal Government was also not liquid. 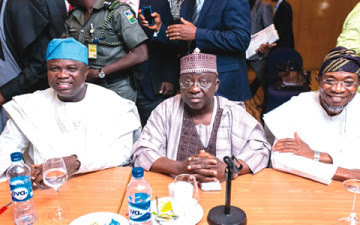 The payment of the debts was one of the issues raised and discussed by the Nigeria Governors’ Forum at its meeting in Abuja on Wednesday. Their Chairman, who is also the Governor of Zamafara State, Abdullazez Yari, read the communiqué after the meeting. Yari said the governors had agreed to meet with Buhari next week over the issue(debt payment). He said, “We all know that the economy of the country is in a bad shape. So, what we suggested and agreed on was that a number of state governors have executed various projects for the Federal Government. “So, instead of looking for that (bailout), let us ask the Federal Government to settle that backlog owed us so that we can move forward. “In nearly all the states, you may have N10bn or N20bn owed. Like in Lagos, more than N50bn was spent on federal projects that has yet to be settled. Yari added that the governors were threading softly because they were aware that some federal parastatal and agency workers were also being owed salaries. He said, “As we are (in) bad (debt), the Federal Government is also on the same lane because some of the agencies and parastatals have not paid the salaries of their members of staff for six months. So it is not only the states that are owing some of their employees. Apart from this, Yari said that the governors had agreed to hold a retreat on how states could enhance good governance and improve their revenue base. The Zamfara State governor, who will serve as chairman of the forum for one year, added that his colleagues had also agreed to work with the President to move the country forward. Also speaking, Governor Adams Oshiomhole of Edo State stated that the problem facing the states was not payment of salaries alone, but meeting their obligations to all Nigerians. He said that Buhari must stop the stealing of public funds by greedy Nigerians so that the country could move forward. The governor lamented that only $2.5bn was left in the Excess Crude Account as of Wednesday. He said, “To stop the fleecing; stop the stealing and get those who had stolen return the money. We are surprised that the excess crude fund has dropped to $2.5bn.